Cast: Chiara Mastroianni, Catherine Deneuve, Danielle Darrieux, Simon Abkarian, Gabrielle Lopes, Francois Jerosme. Written and directed by Vincent Paronnaud and Marjane Satrapi, adapted from the autobiographical comic book by Marjane Sartrapi. Story: Cartoon of an Iranian kid in the Islamic Revolution. UK Certificate TBA, probably 12A. The UK version is tipped to be dubbed in English though I can't promise anything. 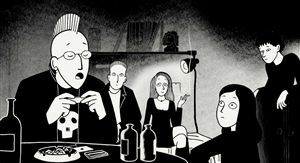 Well there was me thinking Ratatouille had the Best Animation Oscar all sown up and now Persepolis comes along. I'm still going with the rat, but it's not as clear-cut as I thought. I've never understood how the nominations process works. Surely all the voters can have seen only a fraction of the movies released all year, how can they possibly vote for the best movies from all the countries of the world? Well I don't think they can. I think that each country submits their top dog for Best Foreign Language Film and some of them trickle through to the other categories. Doesn't really seem fair, does it? Although, thinking about it, The Diving Bell and the BUtterfly is also French and also features in this year's Oscars so I'm probably talking out of my arse. Except that I'm not even talking. OK - I'm typing out of my testicles. There, that's better. But enough about my hairy brains, Persepolis deserves better. 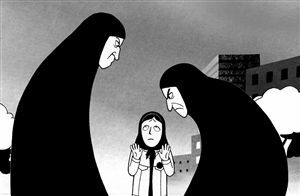 Presented With a beautiful visual simplicity, Persepolis is the world of little Marjane Satrapi, a forthright Iranian child trapped within the intolerance of the Islamic Revolution. Don't worry if the Islamic Revolution makes you think of a spinning Muslim rather than a political and religious conflict - I'd never heard of it either - think of it as a Roman Polanski story (e.g. The Pianist) with the religion replaced and you'll be half-way there. The cartoon format is ideal for portraying the kid's life - the little sprite is adorable yet she's made with fewer lines than Pete Doherty's breakfast - so we buy into the minimalist style and still enjoy it as she progresses into adulthood. There are lots of laughs - mainly from the talent of the animators - though you need to pay attention to appreciate them. Pixar this ain't. 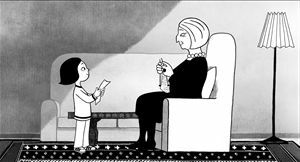 Persepolis is an autobiography - Marjane Satrapi is co-director and author of the comic-book on which the movie is based - and as such I noticed an unexpected lightness to the characters' reactions and the overall mood. Had this been Polanski, the bigoted nastiness happening on screen would have startled the sphinctal starfish, but here we're never far from a light-hearted moment even amongst the darkest of black burkas. As far as I'm concerned that's great news - I don't go to the cinema to be depressed - but it may put off the deeply serious viewer. Its only other sticking point is that some of the main characters are rather pro-communism, which does seem to have sparked some lively (and typically numb-nutted) debate amongst the vociferous empty vessels that infect our species. Ignore them, they've missed the point. Persepolis is a delight. Dismiss the religion and politics, sit back and watch the simply drawn and exquisitely precise animation. I loved it. To enjoy this film you should: be able to identify with a character whose beliefs are not the same as your own. Persepolis was released in the UK on 25th April 2008.